Phil Peel » Blog Archive » Editing standing up. Is this weird? Years ago I remember seeing a TV programme about Walter Murch editing Cold Mountain on Final Cut Pro. But what I thought was really strange was that he edited standing up. Obviously a bit weird. I thought no more about it until recently when I saw a BBC Horizon documentary : The Truth about Exercise. One of the points it made was that sitting is a killer. ..or to be less sensational and more specific, sitting for long periods will shorten your life. …and that got me to thinking. What am I spending most of my time doing at the moment? Video editing and script writing. Both very sedentary, or in other words ..lots of sitting down. In my youth, I was always convinced that the world would blow itself up in a nuclear war. I never expected to get past 30, so I’m somewhat surprised to still be around decades later. As I get older I’m also more aware that the end of my life is getting closer, So the Horizon statistics about the number of days of your life that you will likely lose, due to sitting down, begin to assume a greater relevance. I’ve been nervous about exercise after breaking my rib last autumn, whilst doing pull ups on a doorway and the bar fell off. Yes I know that’s illogical. But my subconscious has got it fixed that exercise = months of pain. 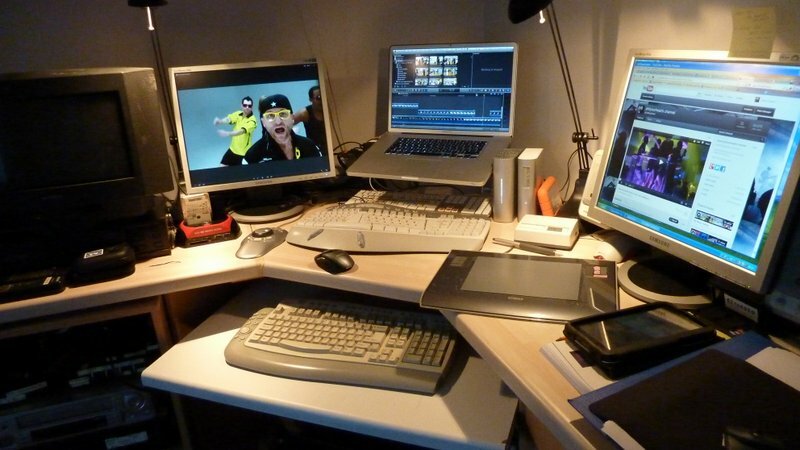 Anyway after seeing the Horizon documentary 3 months ago, I reorganised my edit suite. 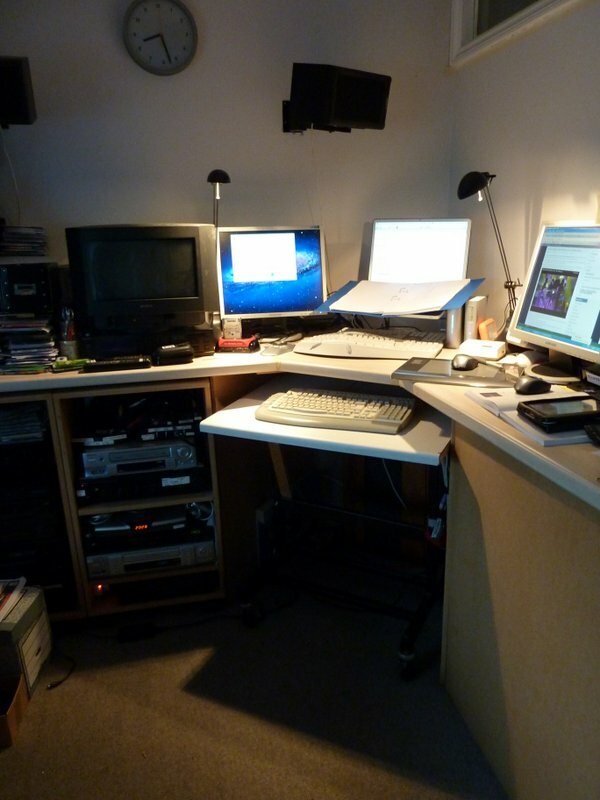 I have the Macbook Pro up on an Icurve laptop stand on top of high ( kitchen style) worksurface. So it’s level with the other monitors. ..and I’ve been standing up whilst editing or writing over the last 3 months. ..and it’s great. Admittedly my feet get a bit sore after 12 hours or so. Today I’ve been using it for 8 hours. But I’m sure it better for me. I think I’m losing weight. I use an ancient Microsoft Natural Ergonomic keyboard, that is hideous against the sleek looks of the Mac, but is far kinder to my wrists. Here I’m I’m using it for scriptwriting. 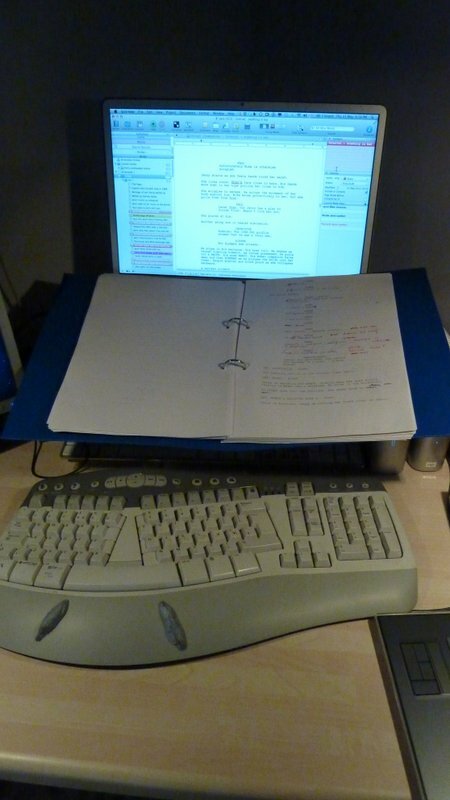 So the keyboard of the Macbook is a convenient rest for the printed script. For rewrites I print out and write notes on the pages. Incidentally I’m using Scrivener to write with, which I’ve found is really excellent. ..and here I’m using it for video editing using FCPX. 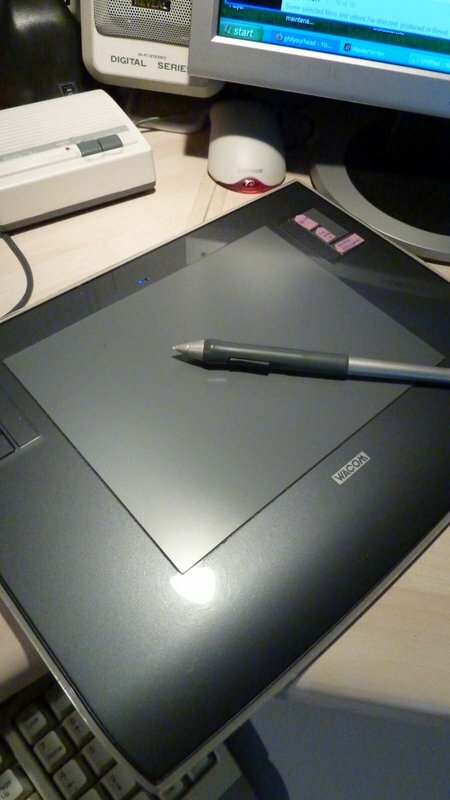 On the right hand side is a wireless mouse and Wacom tablet. On the left is a Contour control shuttle. 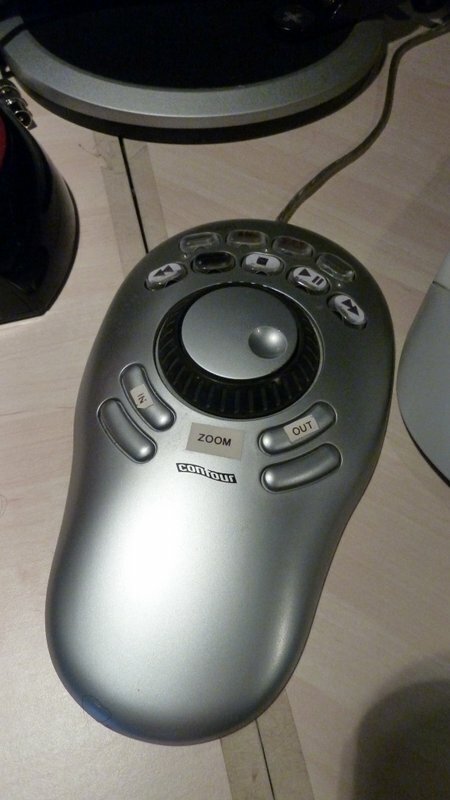 So I can zoom in an out with the left hand, whilst using the tablet/mouse simultaneously with the right hand. One disadvantage of this is that I occasionally use the wrong keyboard when using the PC, which can mess up the main edit on the Mac. 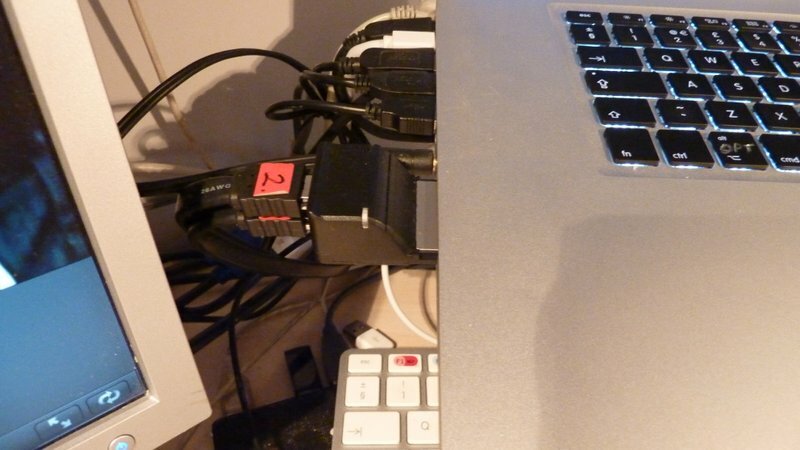 The Macbook Pro also has a dual port ESATA adaptor running into 16 terabyte RAID array. I read somewhere that Charles Dickens like to write while standing up, and had a special escritoire made for this purpose. So I suppose standing up to write on a computer is evolution ? Interesting to read their articles. It all seems to make sense.